There are many solubility theories and many solubility parameters such as Hildebrand, Hansen, Fedors and Van Krevelen. Most popular SP value is Hildebrand and Hansen. For the polymer chemist, Fedors or Van Krevelen method is familiar. The base of these method is Cohesive energy density. Small sp value is for the polymer I think. Here I will explaine about Hildebrand and Hansen solubility parameter that base on heat of vaporization. Hildebrand SP value is calculated with following scheme. This parameter was first introduced in the paper “The Solubility of None-electrolytes.1964” by Hildebrand and Scott. The SP (solubility parameter) value was first appearing in this scheme. The concept of “likes dissolve likes” comes from this idea. The Hildebrand SP is based on just Heat of vaporization, so if the Heat of vaporization is very near even though chemical structure is so different, Hildebrand SP become same. For example, the Hildebrand SP of Ethanol and Nitroethane is almost same. But every chemist feel strange if they hear solubility of Ethanol and Nitroethane is same. Hansen divided this heat of vaporization energy into 3 parts. I show you 3-dimensional chart of Hansen Solubility Parameter of Ethanol and Nitroethane. You can easily find these 2 solvents' solubility are different with this 3D chart. So, Hansen Solubility parameters (HSP) include Hildebrand SP value completely, and I can think about solubility with the direction of vector and length of vector. I have many articles about Hansen Solubility Parameters (HSP) in Pirika, so please refer if you are interested in. There are 2 type of unit for solubility parameter, one is (cal/cm3)0.5 and the other is (J/cm3)0.5, these day, Joule base of unit is much popular. if you roughly want to convert cal. base to Joule, just multiply 2*(cal. base SP). There are several estimation method using Group Additivity method. I can not apply direct SP value with Group Additivity method. There are 2 type of properties like boiling point and density. Boiling Point increase as molecular become large. But density will not become large as volume increase. 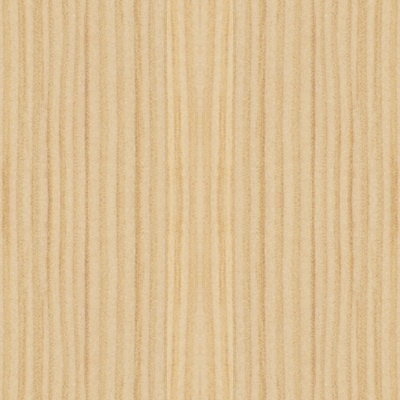 SP value is density type of property. So I need to estimate G (Cohesive Energy) and V (Volume) then calculate SP value. The G/V is called Cohesive energy density. 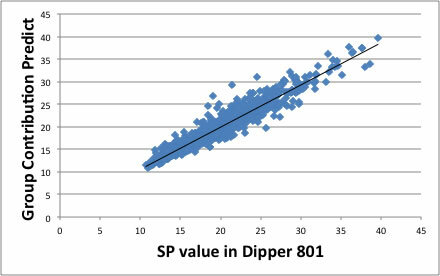 I examined the SP values listed in Dipper 801 database with my method. The compounds that show large error, are carboxylic acid. i wrote the reason at the heat of vaporization article. Please refer to if you are interested in.